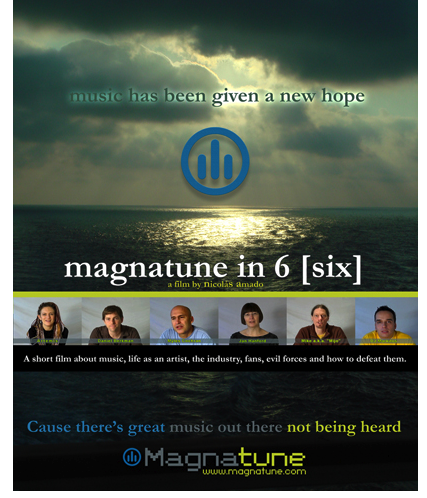 Magnatune always shares half of their proceeds with the artists they distribute, they provide you with multiple download options, including OGG, FLAC, and even uncompressed digital audio (as well as a variety of MP3 options), they license music freely to non-profit and open projects (including a generous, free podcast license; the notion of 'non-profit' is not limited to the strict legal definition. Get music and/or make a donation. Make magazine's Open Source Gift Guide is an eye-opening collection of the products and services that aid your freedom to tinker, share, improve and learn seriously. Some of the goods offered are more aspirational than practical holiday gifts: you'll be hard put to track down the OpenMako unrestricted GSM phone, or Chumby, Bunnie Huang and co's prototype hackable alarm clock, in time for Christmas. 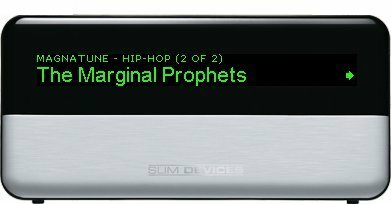 But popular open products from Neuros, Magnatune's DRM-free FLAC audio, the open source MediaPortal Windows media center, and Rockbox, the free firmware replacement for most MP3 players, show just how vibrant a market can be when it casts off DRM shackles and sets about re-asserting user control. And then there's Make's highly sensible suggestion of a $100 donation to the EFF - the perfect gift for those few friends of yours who aren't already members. I'm giving a presentation tonight at the openbusiness.cc run "MiniBar London". You think about creating the next Last.fm, flickr, or Web 2.0 start up? You think London lacks opportunities to meet up and discuss those ideas? For those who don’t have time to attend a full BarCamp, some of us have come up with MiniBar, a chance to snaffle some free beer while discussing p2p, Creative Commons, web applications, social networking and general Web 2.0 mayhem & fandango. It’s fun, it’s free and you don’t have to bring a sleeping bag. Come to Corbet Place for an early Friday evening get together the at Truman Brewery (off Brick Lane, next to Spitalfields Market and Liverpool Street Station). There’s a (normal sized) bar, a DJ, and some nice people to chat to. Who knows, you even might find out something you didn’t know. For the first one John Buckman of Magnatune.com and Bookmooch.com will say a couple of words about music sharing, p2p philosophy and Creative Commons. The music is organised in two main hierarchies: artist/album/track and genre/artist/album/track. There's also a "new music" hierarchy that goes date/album/track. 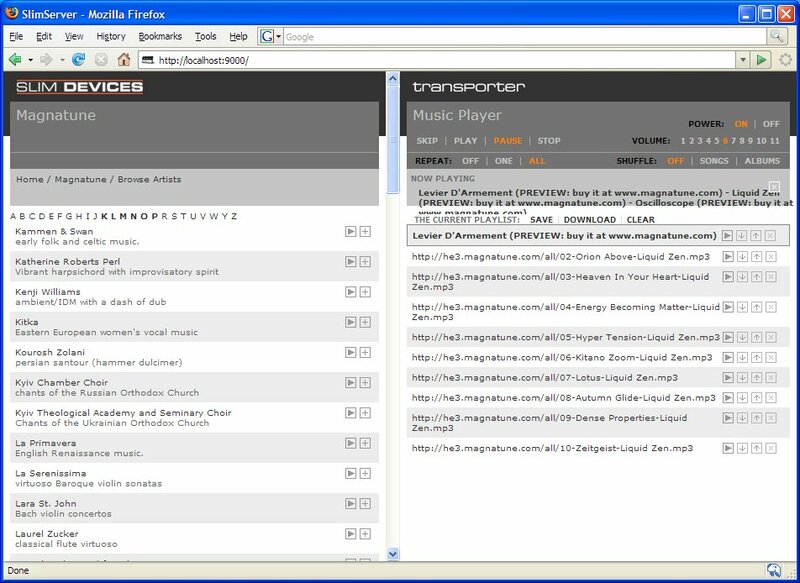 (The first is hopefully useful for people trying to find music by name, the second for new users exploring what's available, and the third for long-time users who just need to occasionally sample the newer stuff). Both hierarchies are available on the Squeezebox's display and also in the plugin's web pages. The web pages have "more info" and "buy" buttons that go to the appropriate pages on magnatune.com. 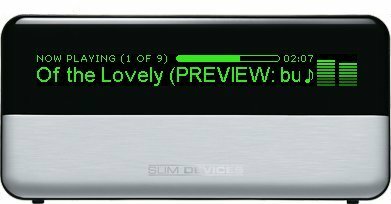 If you have a bit of time to play with it, SlimServer comes with a Squeezebox emulator (SoftSqueeze) which should demo the plugin nicely. I asked Ian to send me some screen pictures, which he has, and I'm displaying below. Very, very nicely done! I received a worried email from the OpenSUSE folks, who had de-activated the Magnatune support in Amarok for their next revision of their Linux distribution, because they had privacy and security concerns. They were worried about how (if at all) the credit card details were stored in Amarok, how the information was transferred to Magnatune, and if the Amarok developers had any access to transaction info. purchase info is transferred via https:, just like online web shops. Info about how to re-download the music (and artwork) is saved in Amarok, but this has no personal information in it. The OpenSUSE people seemed satisfied by these answers, and I'm hoping that means they'll re-enable Magnatune in Amarok, as the vast majority of Amarok users are going to be getting their version from their Linux distribution, not downloading and compiling their own copies. Thanks again to Nikolaj for making the plugin, responding to questions, and (now) working another revision. 1) What is the status of defining a plugin structure for things *like* magnatune. If it is still in development, are there some things a newbie contributor like me could help with? 2) Has any consideration been given to making these sorts of things scriptable (via DCOP?) It seems to me (after a very cursory examination of some scripts and amarok code), that one could have a DCOP interface that would allow one to setup a parser/fetcher/dbhandler to correspond to a browser gui (a tree and some script defined buttons). First of all, no one (to the best of my knowledge) is currently working on a plug in system / generic interface for these things. I will venture a guess that I Will be doing a substantial amount of this work when the time comes, and I doubt it will be happening for a while still. I still have quite a bit of work to do refining the Magnatune stuff and I really think that it will be a mistake to branch out before this functionality is really solid. Secondly, (and this is just my own personal opinion) I don't believe in building frameworks from scratch. I have seen this fail too many times. Instead I would much prefer, just like you mentioned, to factor out common functionality from a number of similar, working, features. Discussion went from realization details to user interface design. Seems like we will have to wait a bit longer until generic solution for online stores and catalogs is developed. I couldn't find any detailed information about the transaction process and how the personal data of the users is secured. (1) It uses https to transmit information. (2) It only used the name of an Amarok developer (Nikolaj) to identify the transaction as coming from amarok during the beta period. Once we went gold the name was changed to amarok. Again, this was to identify the transaction as coming from Amarok and it doesn't use anybody's account. (3)No one can see any credit card information except the people at Magnatune that execute the transaction, and even then it is probably quite automatic. (4) We did a horrible job about being clear in communicating the nature of the transaction. This will soon be fixed if it hasn't been already. The only case in which any personal information is stored is if amarok is configured and built with Debug=full in which case the purchase url is printed to the log. It does store the Amarok reply xml data to use for later redownlaoding of a purchased track, but this does not contain any personal information at all. Developers agreed that this single bit of debug output can be removed without harming the value of debug info. This hilarious new video from Creative Commons explains how copyright, sharing, and CC work. Plus, it's wet-your-pants funny, with the voices delivered in a South-Park style and deliciously silly animation style. And, they mention Magnatune in the animation as well! This past Thursday, November 9th John Buckman officially accepted an invitation to join Creative Commons board of directors. His appointment reflects Creative Commons’ growing interest in commercial applications of CC principles. As many readers of this blog are aware, Buckman’s business—Magnatune Records—is an Internet based record label that uses CC licensing to gain wider audiences for the label's catalog. Magnatune currently represents over 220 recording artists and released its 500th album in October. Discussion of Buckman’s appointment to the Creative Commons board came on the heels of a recent visit to Tokyo for the New Context conference, where John and Creative Commons founder Larry Lessig met to discuss in depth how Creative Commons licensing models could be applied to commercial ventures. John also recently created and launched Bookmooch.com, an online community for exchanging used books. The site allows people to exchange their used books via snail mail, and Buckman is currently working on ways to reward authors when their book is traded. In a recent blog post about Bookmooch, Larry Lessig recently wrote that: “The next challenge for commoners is to figure out how sharing economy interacts with a traditional commercial economy." Both Magnatune and Bookmooch reflect John's deep commitment to the open culture movement, and the appointment to the CC board is expected to present lots of great new opportunities to grow the movement and promote its next stage of development. John Buckman has announced that Amarok, the popular KDE music player, now includes an integrated store for his company Magnatune, one of the largest netlabels offering DRM-free, CC-licensed music, and a fair deal for their musicians. This is an inspired move by all parties involved - as well as making it easier than ever before for music fans to access Magnatune's catalogue, it provides newcomers to GNU/Linux with an alternative to the functionality that they have come to expect from Apple's DRM-encumbered iTunes service. In addition, Amarok and Magnatune have the advantage of of providing all the practical benefits of free software, un-DRM'd open formats and liberal licensing. If that wasn't enough to make the Magnatune store a very attractive proposition, 10% of the price of each sale from the Amarok Magnatune store will go straight back to the Amarok project, providing an attractive way to support one of the most exciting free software projects around. Free software and DRM-free music met this week when the Amarok music player added a built-in "iTunes-like" music store in its latest release -- making it the first open source music application to include such a service. Version 1.4.4 of the KDE audio player integrates a front end to the Magnatune record label, through which users can preview songs and purchase DRM-free tracks and albums in MP3 format. Magnatune offers free track downloads for all of its artists through its Web site, so -- strictly speaking -- the Amarok feature brings no new functionality, just convenience. Apple's iTunes Store offers songs from multiple, major record labels, and thus far more artists and artists of wider popularity. Magnatune, however, offers a direct-to-artist royalty scheme that it would claim is more fair to performers, and its commitment to the standard MP3 format, with no digital rights management, is more fair to consumers. As to the relative merits of indie versus major label artists, there is no accounting for taste. The Amarok development team says that the Magnatune deal was not a planned partnership. Nikolaj Hald Nielsen told the Amarok mailing list "Magnatune just made their entire catalogue available as an XML file on their site (which was what gave me the idea for this feature) and proved responsive to my request for an API to purchase music directly from within other programs." For its part Magnatune is receptive to the possibility of working with other third-party application developers to bring its music to a wider audience. 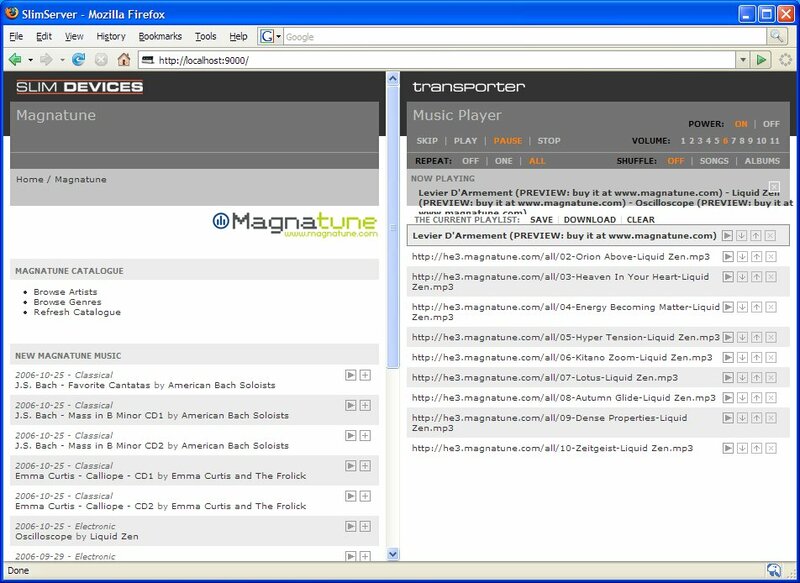 The site already publishes information about using Magnatune XML feeds, including demos and instructions for embedding a music mini-browser in Web sites and applications. Using the service to enable music purchases requires an API key, which must be requested and approved by Magnatune. 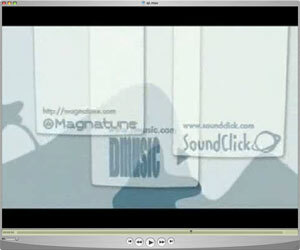 The most significant innovation of this version is the integration of the Magnatune Musicstore. 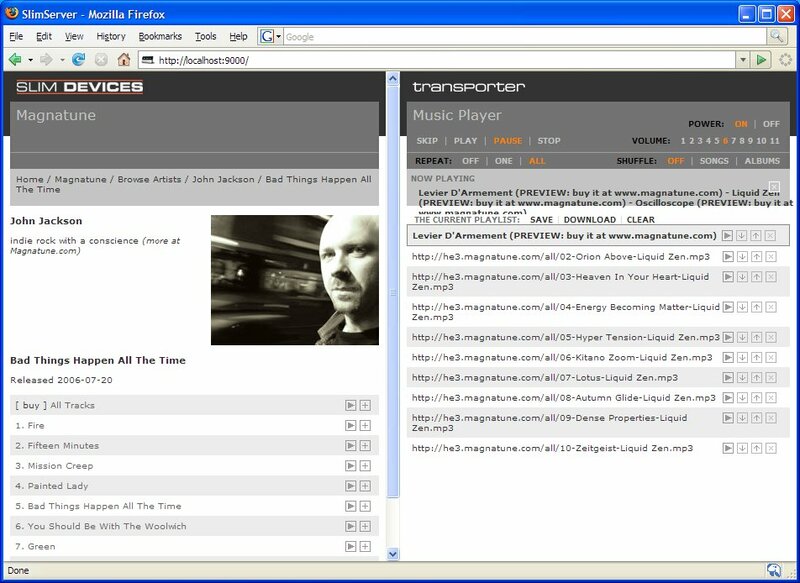 This allows you to use Amarok to listen to songs you are interested in and purchase them in a DRM-free format. It also shows information about the artists and the titles. Amarok is One of the most widely used, & loved music players in the open source world, it runs on Linux (kde), and has just about everything a music lover could want. it automatically downloads song lyrics, fro ma free service, automatically looks up banks on Wikipedia, retrieves cover art, does ratings, categories, mood-themes. you name it. And now it's going to allow automatic download of music, similar to ITunes, but without the DRM and other BS. the new music store will sell Creative Commons licensed, music, including artists from the rather open label Magnatune. Amarok, a very popular music player (like iTunes) for Linux, is now shipping with extensive support for Magnatune built-in. Anyone using Amarok can now easily listen to all of Magnatune's albums in their entirety, just as you can on the Magnatune web site, but the experience is friendlier and easier since it is within the audio player itself. Users can also buy the music directly from inside Amarok, with the credit card form in Amarok passing the data to Magnatune. The music is then automatically downloaded and added to the user's Amarok library, in the same style as with iTunes. a) full previewing of all music before buying, not just 30 seconds. f) 10% of the purchase price goes directly to Amarok. Below are screen pictures of the integration in Amarok. Notice how easy the browsing is, and also how artist bios and photos are directly available inside Amarok. Our friends at Amarok released version 1.4.4 of their intuitive Linux media player this week, complete with a DRM free music store featuring Magnatune artists. The new release also includes a slew of other features, as well as under-the-hood improvements and bugfixes. From Amarok: "We're thrilled to be able to take our long association with Magnatune to new heights with the addition of an integrated DRM-free music store with full-length mp3 previews." Fan reaction was immediate and enthusiasic. From one Magnatune supporter “I am an avid Linux user and anti-DRM. When the newest version of Amarok came out with built in support for Magnatune, I was curious. Within 5 minutes of upgrading my Amarok installation, I bought an album from you guys, and plan on purchasing more and will definitely be spreading the word about you guys (particularly my wife, she's addicted to iTunes). Keep up the good work!" 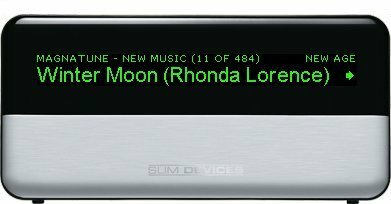 A lot of work went into the Amarok/Magnatune integration and it's really nice to be able to listen to our music easily inside the player, sort of like iTunes, except with the entire song (or album) playing.